What will it take for the majority of research to be academy-owned and open access? Here at Scholastica, we’ll be focused on this question during the first Academic-Led Publishing Day on February 7, 2019. We’re excited to be taking part in the global digital event, which is aimed at fostering discussions about current and potential academic-led publishing initiatives. Academic-led publishing refers to scholarly publishing initiatives wherein one or more academic organizations control decisions pertaining to copyright, distribution, and publishing infrastructure. Academic-Led Publishing Day presents an exciting opportunity to build bridges between different stakeholders in the future of academy-owned publishing, including university-based publishers, professional associations, scholars, research funders, and service providers. As we lead up to the event, we wanted to start some discussions around academic-led publishing. 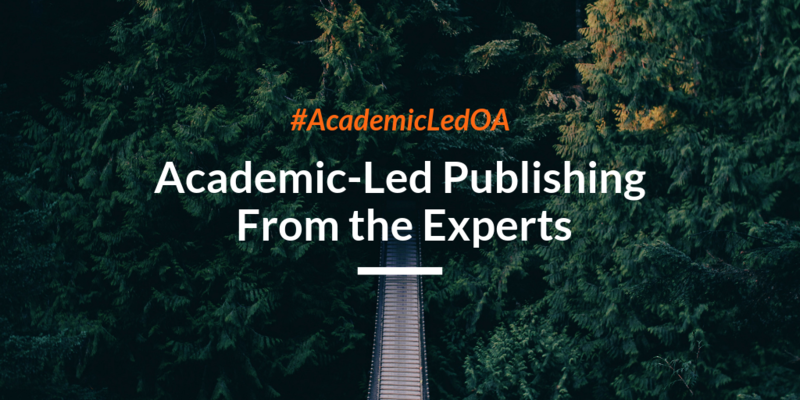 In this blog series we interview OA experts about academic-led publishing initiatives that they’re involved in and their thoughts on what’s needed to make the majority of research academy-owned. First in the series we welcome Dr. Michael P. Taylor, a computer programmer with Index Data and a paleontologist with the University of Bristol. He is an active advocate for open access to scholarship and open data. In the interview below he discusses his current OA advocacy and his hopes for academic-led publishing. Can you share what your current OA advocacy focus has been around for those unfamiliar? What initiatives have you been working on or promoting? One advocacy project I was very involved in is Who Needs Access?, which tells the stories of individuals outside academia who need access to the scholarly record. The idea is to interview patients with rare diseases, disability rights campaigners, entrepreneurs, small business founders, and others to tell compelling stories of why open access is important outside of recognised academic circles. I think this is a really important body of work to build up, but I’ve run out of time, energy and momentum to keep writing for it, so I am actively looking for someone to take over the site and continue its work. Get in touch if that’s you! You can reach me at dino@miketaylor.org.uk. Most recently, I’ve been one of the people behind the Fair Open Access Initiative (Fair OA), which seeks to codify what we think is required for a journal to be fully open, fully sustainable and fully accountable to the community that uses it—and to support journals that are aiming to attain those goals. We have a bunch of great people involved with this, and some funding to help paywalled journals that are seeking to flip to Fair OA, so again, if that’s you, get in touch. One thing that comes up a lot in my discussion of access to scholarly works is Sci-Hub. I have a complicated relationship with Sci-Hub. On one level I deplore that it’s necessary, and I share others’ reservations about its legality and opacity; but at the same time, I recognize that it does an enormous amount of good. I’ve used it myself many times when in the course of my scholarly work I’ve needed to read papers that my university doesn’t have subscriptions for. And my wife is doing a Masters in musical composition and also finds over and over that her university doesn’t have access to works that she needs to read: so again Sci-Hub is the answer. I’m not exactly happy about it, but adding up the positives and negatives it’s clear to me that Sci-Hub is a net win for humanity. Here’s the blog-post where, after a lot of soul-searching, I reached that conclusion. What do you think is the role of libraries and university departments in supporting academic-led publishing? Can you give examples of groups you think are leading the way? MT: Well, I have a lot of personal affection for university-led publishing, because two of my first three papers were in a little journal called PaleoBios, published by the University of California Museum of Paleontology. At the time it wasn’t open access, but they are in the process of transitioning to author-retained copyright, with a choice of Creative Commons licences. Once they get that sorted out, I really should send them one of my forthcoming papers. Ultimately, the academic community has to own and control the journals that its members publish in. The present situation, where scholarship is owned by for-profit corporations is flatly unacceptable: we would never have designed a system like this, and it’s come about only by historical accident. What does it mean for “the community” to own a journal? In practice, it may mean that a university or its library is the legal owner, and that will be a big improvement on the status quo. But even that is not really good enough: journals should really not be controlled by any one organization, but by the community as a whole. The best and most explicit exposition of what’s needed is the Principles for Open Scholarly Infrastructures. This document is kind of boring, but deeply important. Unfortunately, we’re not in a good place at the moment regarding library leadership in publishing. We have fragmentation across 6,000 or so separate and largely incompatible Institutional Repositories (IRs), and the promise of being able to aggregate them via OAI-PMH has proven largely false, for both good and bad reasons. There is no single place to search for open-access manuscripts in all IRs. Jisc’s CoRE is working hard to remedy that, but technical limitations and metadata incompatibilities limit what they can do. This fragmentation across institutions, and the perception that individual IRs can sometimes be caught up in building little private kingdoms, can’t help but have contributed to the depressingly low manuscript deposit rates that most IRs struggle with. What’s the solution? I’m not sure, but one approach that’s working well is that of ORBi, the IR of the University of Liege in Belgium. Under the inspired leadership of Bernard Rentier, the university long ago adopted the policy that all the university’s internal decisions - promotion, tenure, even allocation of parking spaces - take into account only publications that have been deposited in ORBi. Write a paper in Science or Nature, but fail to deposit it in the IR, and it’s of no value to you in internal decisions. Unsurprisingly, ORBi has a very high deposit rate—something that other IRs can aspire to replicate, though it will be necessary to lobby less enlightened university leaders to make it so. But in the end, I am probably more interested in universities publishing journals than in their archiving manuscripts. While we retain our obsession with the “version of record,” IRs will always be perceived as second class. I hope to see us increasingly cutting out the middleman: not giving our manuscripts to Elsevier and depositing the unformatted version in a university’s IR, but simply publishing in the university’s own journal (or that of another university if the subject matter is a better fit). Do you think that the majority of journals will be academy-owned in the future and why? What do you think would be the main benefits if this were the case? MT: They have to be. It’s simply insupportable for the output of the academy to be owned by corporations and managed in whatever way maximizes those corporations’ profits. We’re better than that. The great project that we’re engaged in is for the benefit of humanity. Sorry if that sounds hippy-dippy, but it’s the simple fact of the matter. Our purpose is to create new knowledge and share it with the world. If instead we create new knowledge and share it with Springer Nature’s shareholders, we have failed. What steps do you think scholars should be taking on an individual level to help further OA and academy-owned publishing? MT: On the most basic level, there is never any reason for a scholar to write and publish a work and not make it open access. For most disciplines there are good open-access journals to publish in. When those are not an option, because there are no suitable journals in the specific scholarly field, or because processing charges are prohibitive, articles may have to be submitted to paywalled journals; but there is no reason not to deposit the peer-reviewed manuscript in a repository that’s open to the world. Secondly, I never perform peer-reviews for paywalled journals, and I don’t believe anyone should feel obliged to do so. Peer reviewing is unpaid work that I do as a favor to the community that I’m a part of. I’m cool with that. I’m not cool with doing voluntary work for Elsevier’s shareholders. Whenever I’m asked to review a paper for a non-open journal, I politely decline, explaining my reasons; and I also contact the authors politely suggesting they consider withdrawing their manuscript and submitting it to an open-access journal instead. You can see example messages along these lines here. I’m always pleasantly surprised at how sympathetic and constructive the responses are, from both editors and (more surprisingly) authors. Third, it goes without saying, I would never act as an academic editor for a paywalled journal, and I don’t think anyone else should, either. You can make just as big a contribution, probably a much bigger one, editing for an open-access journal. In short, I hope to starve paywalled journals of submissions, reviews, and editorial services. Does that harm the journal? Yes. But I’m fine with that. Because a journal that’s unavailable to 99% of the world’s population doesn’t deserve to survive. It’s too easy, within academia, to slip into the mindset that research is just a game that we play together, to impress each other. The moment it becomes that, it forfeits all right to respect, and indeed to funding—it’s just our hobby. No. We have to be better than that. We do research for the world, and that means that the results have to be available to the world. Are you in the process of starting an open access journal, or are you planning to transition an existing journal to an OA publishing model? In this post we break out all the steps to get an OA publication up and running. The start of a new year is always a good time for reflection. As we head into the new year, we wanted to take a look back and share some blog highlights from 2017. When it comes to effective editorial team operations, Jennifer Mahar, executive peer review manager at Origin Editorial, says there are certain hallmarks that set apart the best teams from the rest.